Low prices. OrangeSmile.com offers car hire service in Jamaica on the lowest-rate-guarantee basis, since we work with car suppliers directly. For your search criteria in Jamaica, we always select and show the best rental offers. The car reservation process consists of 3 simple steps: (1) search for available cars for your dates in Jamaica; (2) select your car type; and (3) fill in the booking forms. Once the reservation is completed, you will receive a confirmation voucher to your email address. During the booking process, please check your rental conditions. To pick up your car at the rental point in Jamaica, you need to provide our confirmation voucher, your driving license and a valid credit card. The final payment is normally carried out at the pick-up point. Our car hire points in Jamaica accept VISA, MasterCard, etc - please check your rental conditions. At the pick-up point, please read the handling manual and check the car for present defects. OrangeSmile.com wishes you a pleasant journey to Jamaica! The car hire reservation system OrangeSmile.com allows renting a vehicle in Jamaica within 10 minutes. Our largest database of car suppliers enables us to provide you a rental car in Jamaica at the cheapest rate ever possible. At rental locations in Jamaica we offer the following car sizes: mini, compact, economy, standard, premium and luxury. The following car types are available in Jamaica: Sedan, Hatchback, Jeep, Cabriolet, Coupe, Minivan and Minibus. This famous resort has always attracted fans of unhurried beach rest and walks in magnificent surrounding. Bob Marley, the king of reggae music, is one of indigenous people who have made his country internationally famous. He has become a true national hero and one of main landmarks in the country is named after him. This is the Museum of Bob Marley, which exhibits various items that are somehow connected with life and work of the great musician. Visitors of the museum will see newspaper articles and photos that feature important moments in the life of the musician. Discs made of gold and platinum are the most precious items in the museum. The first guitar of Bob Marley and his scenic costumes are also present there. While exploring Jamaica, consider visiting such sights as the Royal House and St. Catherine’s Cathedral. These landmarks are among the few medieval buildings that have managed to survive. The National Gallery is a great place to see works of local artists. The collection was launched yet in 1920 and has grown much bigger since then. Nowadays, young talents continue exhibiting their works in halls of the famous gallery. Natural places of interest are even more fascinating than cultural ones. Fern Gully is a very interesting place that is home to several hundred types of the mysterious plant. Blue and John Crow Mountains National Park is the biggest and most famous national park in the country. It’s located in the west of Jamaica and looks like a giant plateau with numerous hills and deep ravines. The park is home to many wild animals and birds. During an excursion in the park you will see wonderful caves and winding paths will guide you to the top of the hills, where it’s possible to see local nature in its full glory. As tropical forests in this region are so dense, guides have to clear the way with machete. The Crocodile Pond is another miracle of nature. It’s located close to the west coast of the island. As it is easy to guess from its name, the park is dedicated to crocodiles. 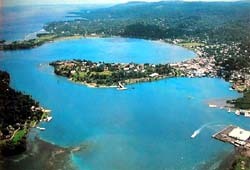 The most famous resorts of Jamaica are located on the south coast. Tourists, who want to enjoy rest on a secluded beach, are recommended to visit Long Bay, St. Anna’s Bay and Port Royal that has become famous because of numerous interesting legends about pirates of the Caribbean. The insurance deposit conditions in Jamaica are individual for each vehicle. Therefore, on the search results page, you can select a car with lowest deposit required.